This cable's special design enables data rates up to 85 MHz at 10 meters, making it ideal for connecting a Racer or Ace camera to a frame grabber having an SDR connector. For Camera Link Full configurations, order two cables per camera. 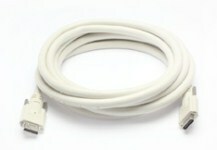 For Base and Medium configurations, order one cable per camera.